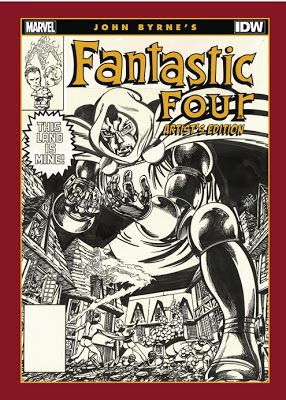 Well, I broke down and spent a good chunk of change on the Fantastic Four Artist's Edition from IDW. The Artist's Edition line always struck me as interesting, but I hadn't seen a volume that piqued my interest enough buy one until now. Basically, what they're doing is reprinting old-ish (mostly Bronze Age, I think) comics, but they're just showing the original artwork -- pencil scratches, eraser marks and all -- at or very near the original size. They're definitely a premium type piece, easily over $100 each, so there's not many of them -- maybe 15 or 20 in all, each focusing on a creator's work on a single character or title. This particular one stood out for me because John Byrne's run on Fantastic Four is what really drew me into comics. I had read them beforehand, but those issues were the ones that really drew me into their world in a way that I hadn't really seen anywhere else. The Star Wars movies came close, but the serial nature of comics meant I could visit that same world month after month, instead of once every few years. 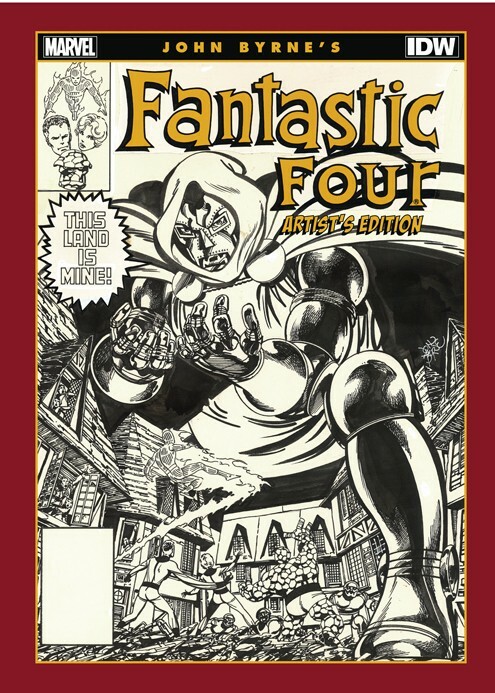 John Byrne almost single-handedly got me interested in not only the Fantastic Four, but the Marvel Unvierse and, ultimately, comics in general. You would not be reading this here today if it weren't for the copy of Fantastic Four #254 I got for my birthday. This volume reprints FF #231, 238, 241, 243, 247, 261 and What If? #36. There's also a selection of covers and splash pages towards the back. But, aside from those reprints, that's pretty much it. No introduction, foreward, or commentary of any kind. Just the work standing on its own. I suspect that the audience for these books isn't looking for anything else. Frankly, I doubt there's much I would've learned from any sort of commentary that could be provided -- hell, I probably could've written something more insightful than just about anyone except maybe Byrne himself. No, there's a reason that IDW is publishing these and not Marvel. There's a decidedly finite market for these books -- I see that the Gil Kane Spider-Man book only sold 2,000 copies, and that seems to be one of the more popular ones. So they're being bought expressly by people who A) remember reading the issues when they came out, B) have a deep affection for both the characters and the artist, and C) are highly interested in the art and production process of comics. It's likely a highly knowledgeable (at least with regards to these particular comics) and highly engaged audience. They're buying the book to see high quality reproductions, and let's not bother with any other nonsense. This book covers really only the first half of Byrne's run on the book, but provides a pretty good representation of his work within that timeframe. You can see his art evolvea and you naturally get a good sense of how he constructed a page. Of all the issues presented, there are four pages of original art from these stories that were, for whatever reason(s), unavailable, and IDW has replaced them with black and white line art, so the stories can still be read in full. Even though these pages were originally drawn well after people stopped discarding comic art casually, I'm still surprised that they were able to get so many complete books for this project. It must have taken a huge amount of effort to track them all down. The book is gorgeous, and I'm sure I'll spend many more hours pouring over the details of Byrne's art that first captured my imagination so many years ago. Very high kudos to IDW for putting these books together in the first place, and going to obviously great lengths to make them look fantastic in the second. I certainly can't afford to buy all the books in the line, but I'll be keeping tabs on it in case the gather together another great collection of fantastic work by a favorite artist of mine. I have this, Sean Kleefeld.